The GREAT Britain campaign is to repeat its partnership with the Clipper Race for a second time after a highly successful campaign in the 2013-14 series. As a Team Sponsor, the campaign profiled British trade, tourism and sport in major markets on six continents. The crew also secured a strong podium place finishing in second overall. "The Clipper Race provides a unique global platform to showcase brand and destination partners around the world," explained Clipper Ventures chief executive William Ward. "We have been very proud to work with the GREAT Britain campaign so successfully and look forward to developing these opportunities with UK brand partners even further in the next edition." The GREAT Britain campaign, will officially launch its 2015-16 race initiative at a reception on 16 January 2015, to an audience of British brands looking to partner with the GREAT Britain team. "We're delighted that ‘GREAT Britain' will once again compete in this iconic sporting event," said Conrad Bird, Director of the GREAT Britain campaign. "We will build on the success of our 2013-14 involvement to develop an innovative trade and tourism partnership with Clipper Ventures that delivers jobs and growth for Britain. "The GREAT Britain campaign is a unique platform from which to promote British technology, innovation, manufacturing, creativity, adventure and hospitality in key markets around the world. I'd encourage British companies to seize the opportunity to get involved and join this GREAT partnership." There is a lot of synergy between the race and the campaign. Historically the original Clipper ships opened up ocean routes that became the backbone of Britain's trading power. Today the matched fleet of twelve Clipper 70 yachts continue to promote global trade and connections through the spirit of adventure and sailing as amateur crew members led by professional skippers, take on the world's toughest conditions in this endurance challenge of a lifetime. Throughout the 2013-14 race, both Prime Minister David Cameron and Deputy Prime Minister Nick Clegg sent messages of congratulations to theGREAT Britain crew members, led by skipper Simon Talbot, as the teams racked up the most amount of race wins of the fleet. 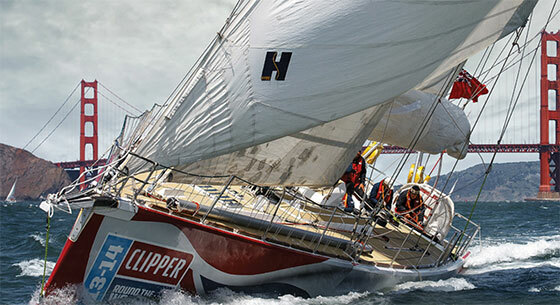 Crew places for the Clipper 2015-16 Race, the tenth anniversary edition of the biennial event which starts in August 2015, are already 70 per cent full with crew members currently in training for the challenge. Who will be on board theGREAT Britain boat? All will be revealed at Crew Allocation on 25 April 2015 at Portsmouth Guildhall where race teams will be announced, and the adventure gets one step closer to reality.